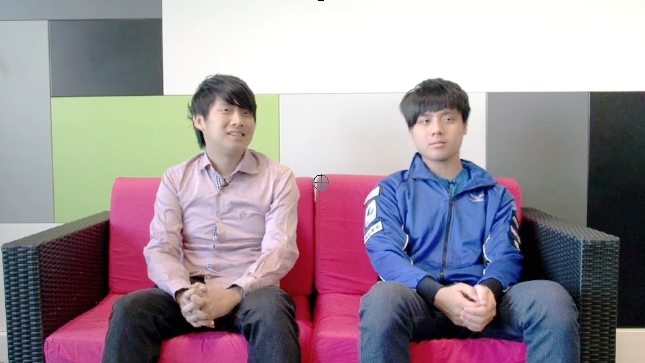 Flash Wolves // Maple: I really want to play against LGD’s mid laner. Please introduce yourself and say hi to everyone. Maple: Hi–hi everyone. I’m FW’s mid laner, Maple! Now, this is already your second day of preparing for group stages. Where do the Flash Wolves currently stand? Please introduce yourself and say hi to everyone. Maple: Hi–hi everyone. I’m FW’s mid laner, Maple! Now, this is already your second day of preparing for group stages. Where do the Flash Wolves currently stand? Maple: I think the goal of practicing has been trying to figure out which champions are strong on this patch. For example, the changes to the top lane meta have been huge. There’s been a lot of Darius, Gangplank, and Fiora–champions like these. They’ve been nerfed a bit on patch 5.18, and they’re not as OP as you’d think. I have faith in Steak’s ability to perform. What are your predictions for your group–Group A? Maple: I think CLG is a strong opponent–each individual player is pretty strong. For KOO Tigers–well, we don’t really scrim a lot with them. And they haven’t competed lately, so it’s hard to say. You’re one of the three big Zed players at Worlds. Recently, what do you think about using this champion? Maple: Playing Zed for me is like Westdoor playing Fizz. I think I play him pretty well. If there’s an opportunity, can we watch you play Zed at Worlds? Maple: Mm, maybe if the timing works out, I can play him. Last question–is there any player you really want to lane against? Maple: I think I really want to play against LGD’s mid laner. I think he’s really aggressive–and I really want to see how we end up playing against each other. Maple: I hope everyone can watch our matches on time, and cheer for us! We’ll work our hardest to win!